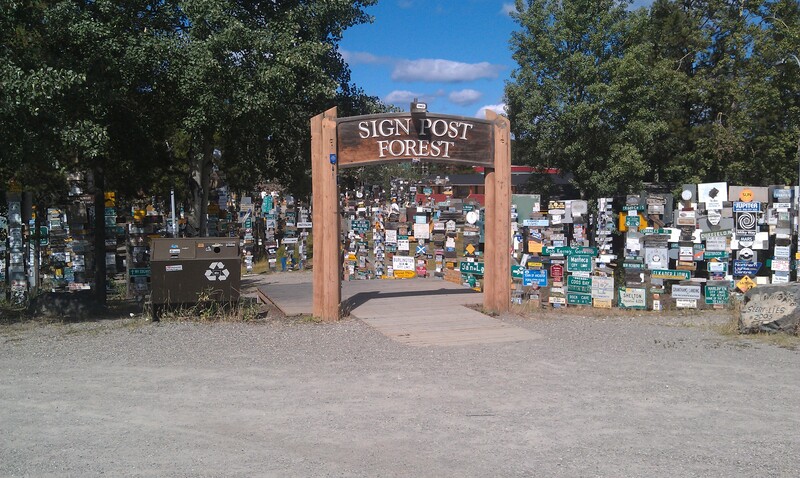 Saturday, 4 August 2012 Fort Nelson, BC to Whitehorse, YT Canada (616 miles) Total Trip Miles – 3668. 10.5 hour riding time. Weather – Cool with temperatures in the mid 40’s to mid 60’s with moderate winds and mostly sunny. 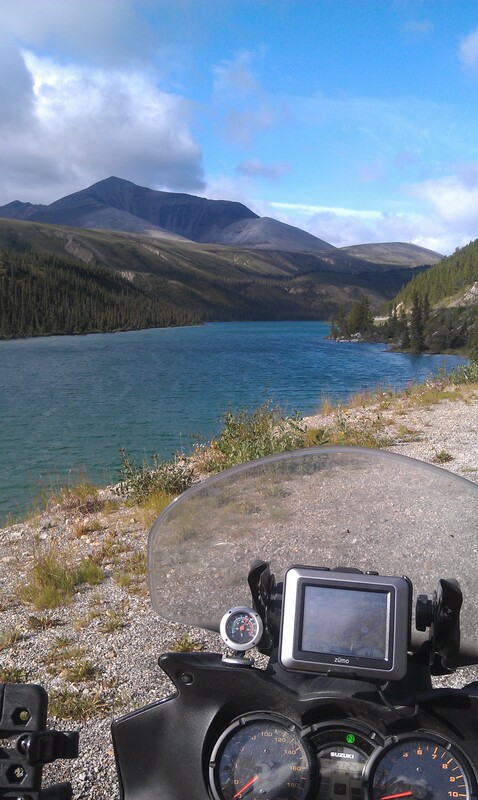 Great riding weather and today brought some of the most beautiful views since the beginning of the trip along with more wildlife sighted. 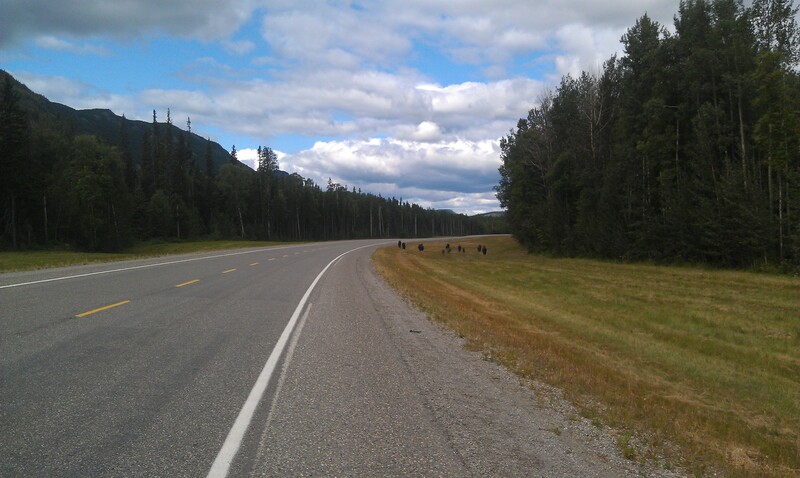 Within the first hour of heading out from Ft. Nelson, I rounded a curve to find a large cow moose standing in the road. As I slowed to stop I noticed its calf to my right in the tree line and at the same time the cow moose crossed the road to my left. Soon after the calf started moving behind me placing me between both the cow & the calf…at that moment the cow came charging back towards me and the bike – no problem here…I know my place and rolled northbound with no time to snap a picture. I also sighted some Elk calfs and quite a bit of Buffalo grazing along the roadside – that right Tye, I do have some pics to post!! Passed quite a few bike riders heading in the opposite direction and chatted with several at gas stops and also passed several couples on bicycles carrying all their gear along the Alaska Highway. Arrived in Whitehorse about 6:30pm and booked at room at the High Country Inn downtown. Looking forward to the ride tomorrow up to Fairbanks – spent 5 years there in junior high and high school and in many respects, it will fill like returning home. It was there I had my first motorcycle, a Harley Davidison 350 Sprint, I learned to ski, hunt, fish, snowmachine, work on aircraft…just about everything I’m passoniate about today. My last visit to the area was back in 1993…so long to be away. This entry was posted in Rally Around the World by rallyaroundtheworld. Bookmark the permalink.